Part of the reason reporting is regarded with such "non-love" by those in the construction industry is the way in which reporting information is recorded and filed. Surprisingly, while their grandmothers are all out playing Pokémon Go, many in the construction industry are laboriously copying field report notes by hand, then transcribing them over onto report forms again when in the firm office. Aside from giving individuals a definite case of "reportingitis", odds unfortunately increase of losing data and missing important reporting deadlines when using these antiquated methods. And given the explosion of construction industry digital products within the last decade, there's no real reason to continue reporting in this way. Today's digital software makes it easier, faster, and more accurate to file these reports than ever before. And given how it's now possible to add sound and visual effects to these reports, they're also a good deal more readable than they were in years past as well. User Time StampsThis helps to verify the integrity of enclosed data, and the authority of designated reporters. Photo DocumentationThe human brain processes and remembers visual information more readily than written, and photo documentation serves not only to compliment written reports, but act both as a warning and evidence. Hours WorkedThis information is actually now mandatory for many government projects, for safety as well as billing purposes. Notes, Issues and ConcernsThe once reliable supplier no longer is? The neighborhood kids are becoming a real nuisance? The ground seems awfully soft at Site A? There should be a section on the report for even the most mundane of observations, in case They Suddenly Become Very Important To The Continuing Health Of This Project. Safety ObservationsAs with notes above, even potential safety issues should be chronicled, preferably with accompanying photos. How these issues were resolved should be documented here as well. Quality Control ObservationsHow are things going on the project in general? Digital technology now allows for the seamless, professional integration of charts and graphics into these reports. So while digital reporting makes this once onerous task faster, easier, and more efficient, the right software is important. 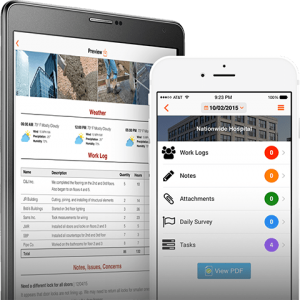 Raken for daily reporting offers general contractors a fast, fluid program that can be used in the field on a variety of mobile devices. Raken's reporting app allows managers both in the field and office to collaborate on daily, weekly, and monthly reports in real time. This reduces the time and money consumed with physical meetings. And addition to adding to the convenience of firms, Raken's new feature Super Daily contractor software program, allows subcontractors to submit their data directly to GC reports at no additional cost to anyone, and saving even more reporting effort. So. Contractors can carry on with the outdated reporting method, or they can use systems like Raken that not only save reporting time, but that allow managers and stakeholders to visit a site even when they can't. Raken doesn't just make reporting easier. It provides an accessible window to the actual project.